This pattern was inspired by the wonderful colors of Noro sitting next to stark black. I got the yarn the day my daughter started at a week long summer camp, and now we both have a fun memory of that time. 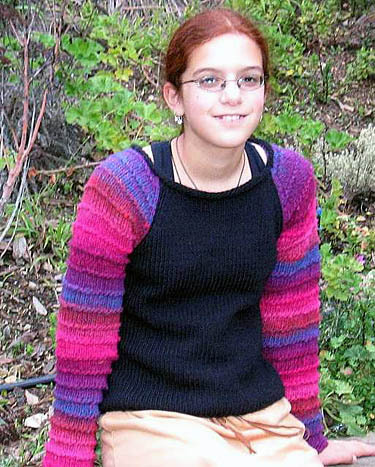 The sleeves are knitted top-down and the body is knitted bottom up. All pieces have seam sts included in the initial CO numbers. These sts are the first and last st of every piece and are to be worked in stockinette. 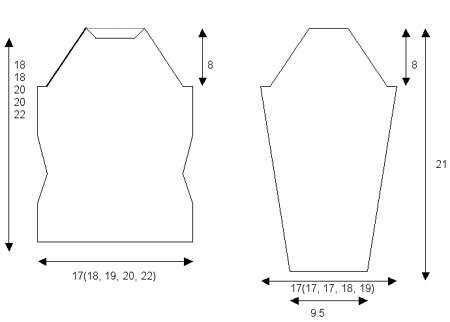 All raglan incs or decs are worked one st in from the edge, not counting seam sts. The decs on the body are worked 6 sts in from the edge, while the body incs are worked one st in from the edge, not counting seam sts. [MC] Noro Kureyon [100% wool; 109yd/100m per 50g skein]; color 89; 4 [4, 5, 5, 6] skeins - Note: This color is discontinued. However, any of the colorways would look stunning when paired with black. With MC and straight needles, CO 17[17, 19, 21, 23] sts. P 1 row. Working in Garter Ridge Patt, inc one st at each edge of every RS row 18 times. (53[53, 55, 57, 59] sts). CO 3 sts at the end of the next two rows. Work two rows even in patt. Cont even in patt until sleeve measures 21 inches from armhole shaping. Work 4 rows even in garter st. BO. *With CC and straight needles, CO 63[65, 69, 73, 79] sts. Work 4 rows even in seed st.
Change to st st and work even for 12[12, 14, 14, 16] rows. Work even until 9.5[10.5, 11.5, 12.5, 14.5] inches from beg. BO 3 sts at beg of next two rows. Next row: K 5. Wrap and turn. Next row: K 3. Wrap and turn. Break yarn, leaving a 5 inch long tail. Rejoin yarn and rep for Right Front. Sew sleeves into armholes, sewing raised back neck and raised front sides to sleeves to create rounded neckline. Sew side and sleeve seams. With CC and circular needle, beg at left back shoulder and pick up 15 sts across left sleeve top, k across all front sts, pick up 15 sts across right sleeve top and k across all back sts. Song Palmese lives in Oakland, where she does daily battle with her two creative cats, very bouncy daughter, crotchety husband and bossy guinea pig. She has started up a design business and is planning on making 2004 a big year for SongBirdGifts. Pattern & images © 2004 Song Palmese. Contact Song.